4-H Centennial project of the National Association of Extension 4-H Agents. 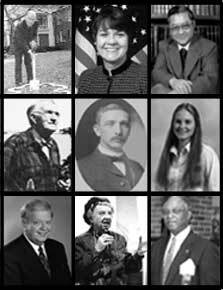 In 2002 we honored the first laureates - volunteers, supporters, staff, pioneers - who made major contributions to 4-H at local, state and national levels. New members will be inducted on a regular basis. To view the Hall, use the index at left. Simply move your mouse pointer over the blue links on each member's page to read more information about them. It is best viewed at 1024x768 or higher.